KULBHUSHAN Pandit, alias Raaj Kumar, was born on October 8, 1927. He started his career as an Inspector at Mahim police station, Mumbai. It is said that he never saluted his senior officers. aHe was noticed in his earlier films like Rngeeli, Aabshar, Ghamand, and Lakhon Mein Ek, but it was as Prince Naushazad in Sohrab Modi’s Naushervan-e-Adil, that Raaj Kumar impressed with his rich baritone voice that revealed his flair for dialogue delivery. In his brief as a husband of Nargis in Mother India, Raaj Kumar paved his way into the hearts of cinegoers. With the unglamorous role of a mill worker in Paighaam, Raaj Kumar proved that his talent was enduring. Raaj Kumar was neither dashing nor conventionally handsome, but when he was cast with top stars like Sunil Dutt, Shashi Kapoor and Balraj Sahni in B.R. Chopra’s Waqt, he stood tallest among them in the role of the suave Raja. Fury pulsated through his voice when he said: Chinai Seth, chhuri bachchon ke khelne kee cheez nahin hoti, haath kat jaye to khoon nikal aata hai. In what became Raaj Kumar’s trademark style, he brought his own traits, fads and fancies to his portrayals. In Lal Patthar, Raaj Kumar won laurels for his landmark portrayal of an obsessed, perverted and psychotic zamindar consumed by jealousy. 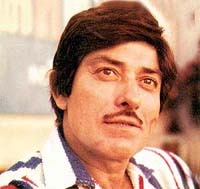 Raaj Kumar later publicly admitted that he had injected some of his own idiosyncrasies into the role. His experience as an inspector too stood him in a good stead when he played a cop in Unchey Log. Subhash Ghai could not think of any other actor for the coveted role of Thakur Rajeshwar Singh in Saudaagar. With his memorable dialogue: Duniyaan jantee hai keh Rajeshwar Singh jab dosti nibhata hai to afsane ban jate hain, mugar jab dushmani karta hai to itihass likhey jate hain, Raaj Kumar packed a punch in this role. Though anger was an emotion done to death by Raaj Kumar in most of his roles, he gave sensitive expression to other emotions as well. He was equally at home expressing pathos. As Chitersen, being entombed alive in the film Neel Kamal, Raaj Kumar captured the pain of unfulfilled love when he said: Tumhare prem mein main mar kar bhee na mar saka aur Neel Kamal, tum zinda ho kar bhee mere prem ko bhool gayee. The hallmark of Raaj Kumar’s dialogue delivery was that he could cast a spell without being dramatic. In the climax scene of Humraaz, his voice cracks when as Capt Rajesh, who was mistakenly presumed dead, he faces Sunil Dutt, the second husband of his wife Vimmi, Main zinda hee kab thha. Main to aaj sey bahut pehle hee mar chuka thha. The audiences thronged cinema halls to hear his acerbic dialogues. These famous lines from Pakeezah: Aap ke paon dekhey, bahut haseen hain, inheen zameen par mat utariyega maile ho jayengey secured for Raaj Kumar a permanent place in the Hall of Fame. From his screen debut in Rangeeli to God & Gun, his was a fruitful journey of memorable characters in 60-odd films. Unfortunately, Raaj Kumar fell a prey to throat cancer that muffled his deep voice to a mere whisper. He succumbed to the disease on July 3, 1996.